I would love a new New Year's avatar, if you have the time. Brandi, if you have time, Nordie would like to have a New Year avatar . . . though he's not much of a party animal. I'll have some choices posted tomorrow for you. I'll keep that in mind as I design! I'll have some posted tomorrow for you! The first in each series has "Happy New Year" sparkling, the second, not. As you can see, I used a "new" Nordie to see if you liked him also. I am taking New Year's avatar requests. If you'd like one, leave me a post! The next holiday I will be posting is Valentine's. 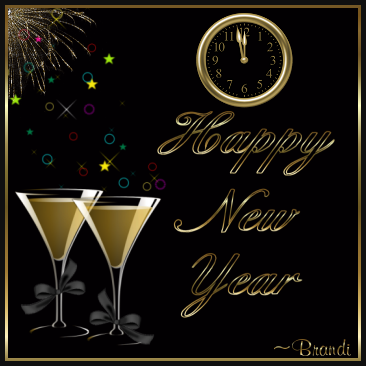 If you have time, I would love a New Year avatar Brandi. If you're too busy, I understand. Hope you and your family had a wonderful Christmas For Valentine's day if you don't mind making me one, could you just do a heart that is split, and my broken glasses next to it? Valentine's day has always been the worst of holidays and that is how I feel about it, thank-you. no rose, I just designed one for Valentine's to your specs that you will really like, I think! Thank you Brandi! I love the hat! Glad you like how I decorated Isabella! BRANDI, I would like my monks to be dressed for New Years. They feel like celebrating. And eventually I would like a Valentine one. I was hoping for a Mardi Gras one too, but I won't push my luck. I guess you are having a snowy day today. I am sick of the snow already. Thanks for all you do. I have made you several Valentine avatars that I will post shortly. Yes, we have about 5" of snow. It's been snowing since yesterday and really hasn't stopped. Just light snow, that has taken its time accumulation. Brandi, my dog loves it! Hi Brandi....Hope you and your family had a blessed Christmas. I have been so busy at work I just sneak in and read and do not get to post much...but of course I like to dress up...only if you have time will you please dress me for the New Year...we can use the little guy that you have in the Christmas Avatar...as always thank you for your dedication. I think your lil guy looks dashing for the holiday. Brandi, once again, you out did yourself. I love the new look. His sparkling eyes are doing me in. Can'w wait to change his clothes yet again! Thank you so much! Page created in 6.317 seconds with 19 queries.